Dry on skin: As this oil dries down the citrus amps just a bit at first, and then the sugared lavender creme slides in with almost a marshmallow vibe. After a bit the citron settles down and the vanillas come out to play. 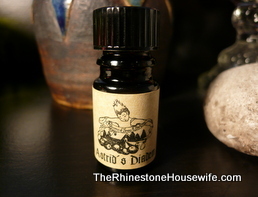 There is just the lightest of whiffs of the patchouli that hovers at the edge of this scent. Verdict: Wow, this is a stunner, an absolute stunner of a perfume oil. I’ve been wearing it non-stop since it came in. It’s a gorgeous warm and grown up scent and not foodie at all. It’s like getting a hug from a fabulous lady you want to grow up to be like. Like Auntie Mame!